Ted Munsat worked with the WFN to improve education in developing countries like Argentina in 1997. Never too late for a tribute, especially for a man like Theodore Leon Munsat (1930-2013). He was an extraordinary man and a natural educator who gave the opportunity to improve neurology worldwide. 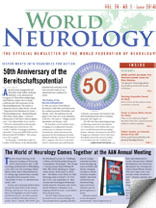 Among other educational activities, Munsat helped launch the American Academy of Neurology’s (AAN´s) continuing education publication, Continuum, was chairman of the World Federation of Neurology (WFN) Amyotrophic Lateral Sclerosis (ALS), chairman of WFN Research and Education Committees, served as president of the AAN (1989-91), and was emeritus professor of neurology at Tufts University School of Medicine, between other relevant activities. Indeed, exceptional merits for only one man. He was honored with the A.B. Baker Award for Education from the AAN, the Sheila Essey Award for ALS Research and the Lifetime Achievement Award from the WFN Research Group on Neuromuscular Diseases. 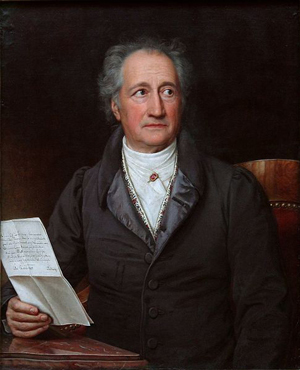 He developed a number of successful educational programs. More than 42 countries all over the world were benefited with a continuing medical education (CME), using the journal Continuum, generously donated by the AAN with an extraordinary local impact. 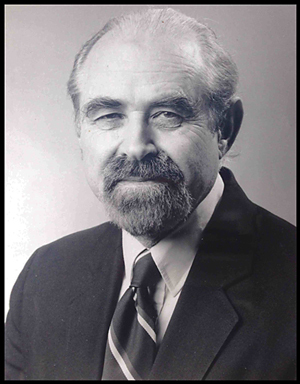 He worked within the WFN to improve neurology and education in many developing countries, including educational programs in Honduras and Argentina. He directed his energies to teaching neurology internationally. I met Munsat at the WFN World Congress of Neurology 1997 in Argentina with his wife Carla. We invited him to an International Symposium as part of the scientific activities after the congress, in Tucumán, CalchaquiesValleys, in the North of Argentina, where several conferences of ALS took place, with Alan Mac Comas, Roberto Sica and other international leaders in neuromuscular diseases. In that opportunity began the idea to develop an educational program for Argentina. The educational program began in 2003 and benefitted over a decade of continuity to hundreds of neurologists in our country with a significant educational imprint. I want to highlight his passion for education, intelligence, humor, kindness with a great ability to make easier the hardest things, a natural leader, a gentleman, an honorable man. He had a warm and sincere personality. he loved helping others every chance he could. I admired and respected him as a man, as a professional and as a teacher. He has left a profound mark on the world of neurology. The Sociedad Neurológica Argentina wishes to give this tribute and extend our gratitude. Dear Ted, thank you very much for all you have done; we shall remember your legacy always. There are few other neurological disorders with such a constant presence in literary works as apoplexy. As early as 1600, the notions “apoplexy” and “apoplejà­a” appear in dramas written by Shakespeare and Lope de Vega. More detailed descriptions of the disease enrich popular novels of the 19th century. Authors such as Balzac, Dumas, Flaubert and Zola must be mentioned here as well as the epical sagas of Dostojewski and Tolstoi 1,2. The American author John Steinbeck used a “stroke” in his work East of Eden as did Philip Roth in his morbid narratives. In the German-speaking world, stroke is dealt with in more than 100 fictional works. The diverse causes of the disease taken up in the “belles lettres” reflect its multifactorial origin conceived in premodern medicine. Melancholic “gloominess” or “thick blood” was grounded on the ancient idea of an abnormal blending of the bodily humors. In this perspective, the disease could be provoked by the “cold and moist evening air” or by “taking a bath at 9° C.” (e.g. in E.T.A. Hoffmann, 1825 and in Theodor Fontane’s Effi Briest, 1894/95). Only approaching present times, the thematic focus and the narrative perspective shifted slowly but constantly. Along with a more detailed description of the symptoms, the story is now set in hospitals and rehab centers and supplemented by technical diagnosis and therapeutic options. To exemplify this shift, there are George Simenon with his Non-Maigret book The Bells of Bicetre (1962) and Kathrin Schmidt’s novel You Won’t Die (2009). In literary works, apoplexy serves different goals. The sudden outbreak of the disease can set the plot going, let take it the defining turn or end a story line. Above all, in recent prose texts, the symptoms bring the fictional patients to get to the bottom of their former life. But the illness also can assume a metaphoric function. The recurrent cerebral insults of the protagonist Oblomow in Iwan A. Gontscharows’ homonymous epic (1859) were meant to illustrate the agonizing czaristic feudal system. In a similar way, the American author John Griesemer in his New York novel Heart Attack (2009) fixed the acute symptoms of his protagonist on 9-11 in order to link individual and collective fate, facts and fiction to a meaningful picture. 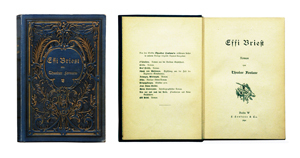 Effi Briest by Theodor Fontane. Original cover of the first edition (1896). Fictional texts are never bare clinical case histories, they never render exclusively neurological textbook knowledge. It is the components that lie beyond the medical horizon that arouse the interest of physicians and a broader public. The anthropological dimension, the look at human despair and hope can further the understanding of a patient’s fate and help to support present-day stroke medicine. Perkin JD. The neurology of literature. In: Bogousslavsky J et al. (eds. ): Neurological Disorders in Famous Artists, Part 3. Basel: Karger 2010, pp. 227-37.
van den Doel EM. Balzac’s serous apoplexies. Arch Neurol 1987; 44:1303-5.
von Engelhardt D. Neurologische Erkrankungen im Medium der Literatur. In: Kömpf D (ed.). 100 Jahre Deutsche Gesellschaft für Neurologie. Berlin: DGN 2007, pp. 346-53. Karenberg is from the Institute for the History of Medicine and Medical Ethics, at the University of Cologne, Germany. Since I wrote my last column, many events have occurred. The neurological world is moving so fast. The WFN remains at the forefront of developments of international activities and is leading in cooperation and promotion of neurology. In January, the Sudanese Neurological Society held its ninth annual meeting in Khartoum. I had the privilege to be invited as well as the president of the Pan African Association of Neurological Sciences, Prof. Riadh Gouider, and the president of the Pan Arab Union of Neurological Societies Prof. Mohammad Tamawy. The attendance and interest was large and intense. There was an impressive eagerness to learn among young neurology trainees in all topics, and the hands-on workshops with bedside patients were fully subscribed. It is heartening to see that relatively small societies in Africa can provide so much high-quality teaching and care. Congratulations to Prof. Ammar El Tahir and Prof. Osheik Seidi for their efforts. 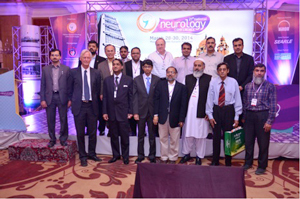 The 15th Cairo Neurology Congress was held in February and again the topics and attendance were impressive. Prof. Wolfgang Grisold, WFN Secretary-Treasurer General attended the meeting. Tamawy and Prof. Osama Abdul Ghani are to be congratulated for an excellent effort. I am sure that across the world many national societies have had their annual congresses and this only enriches the field. The WFN will be delighted to be involved in any way and to help promote and advertise these congresses. Figure 1. 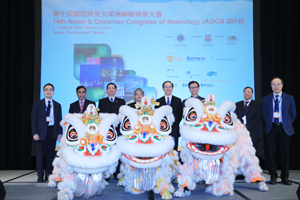 (From left to right) Jonas Yeung, president of the Hong Kong Neurological Society; Man Mohan Mehndiratta, president of AOAN; Wai-Sin Chan, deputy director, Health Bureau, Macau Special Administrative Region; Chin Ion Lei, director, Health Bureau, Macau Special Administrative Region; Patrick Li, president of the Hong Kong College of Physicians; Ping Wing NG, co-chair of AOCN 2014; Leonard Li, co-chair of AOCN 2014; Lawrence Wong, secretary of AOAN and chair, Scientific Committee, AOCN 2014. It seems that wherever in the world neurologists meet, there is always a sense of camaraderie and togetherness. It is also clear that topics vary in their scientific slant and their emphasis on training; but the eagerness to learn among neurologists in training is the same across the world. Teaching courses with live and videotaped cases attract a huge interest and create lively discussions. The WFN grants round is now open, and we hope to receive as many applications as possible. The Grants Committee will start work after the closing date, and decisions will be conveyed to the applicants immediately. The plan is that the WFN will partner with other organizations to increase the amounts of the grants. The Vienna World Congress was not only a scientific success but also a great financial success for the WFN. I, on behalf of the WFN, am most indebted to the Austrian Society for its hard work; and to the EFNS which suspended its annual congress for 2013 to allow just one major neurology congress to take place in Europe. The financial returns to all indeed exceeded expectations, which bodes well for the financial survival and strength of the WFN. As this issue is being published, the amalgamation of the EFNS/ENS in the joint meeting in Istanbul will have taken place. This will create a most solid association. The WFN looks forward to the birth of the EuropeanAcademy of Neurology (EAN) and the elections of its officers so that our relations and close collaboration will continue as before with its two predecessors. The WFN’s strength and ability to reach its goals can only be achieved with the help of strong regional associations willing to collaborate to further the cause of advancing neurology globally. If one reads the EAN’s Purpose and Values, these goals are well laid out in Article 4 of its bylaws. The WFN was born on the July 22, 1957, and during the Vienna World Congress, the Council of Delegates voted to commemorate that day every year as the World Brain Day. The task was given to Prof. Mohammad Wasay, chair of the Public Awareness and Advocacy Committee. The details are in the April issue of World Neurology. By the time this is published, all delegates should have received further correspondence. The WFN history is rich and diverse. Prof. Johan Aarli, WFN past president, is the author of The WFN History: The First 50 years, published by Oxford University Press. By the time this issue of World Neurology is distributed, the book will be launched during the joint EFNS/ENS meeting in Istanbul. The book is essential reading for all. The WFN and other peer organizations have created the World Brain Alliance. See http://www.wfneurology.org. This was started during the previous presidency, and I had the honor of being present during its inception in 2010. The presidents of peer societies last met in Vienna and will meet again to formulate a structure and proceed as the force speaking for all those involved in brain health. Other activities to report are the collaboration with the WHO. This has matured and is progressing well. The Department of Mental Health and Substance Abuse is where neurology lies in the WHO structure. Shekhar Saxena and Tarun Dua are major contributors to the success of the collaboration. 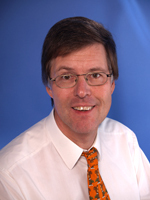 Moreover, Oleg Chestnov, WHO’s assistant director general, has agreed to talk to the attendees of the World Congress of Neurology in 2015 in Santiago, Chile. The WFN is a major funder to our WHO activities and will continue to be so. The ICD11 process is being finalized, and the process is on target. 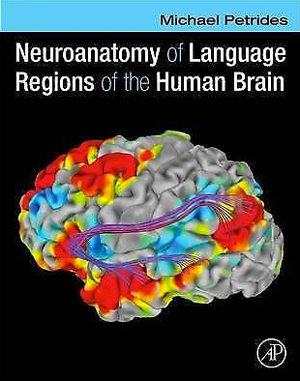 The WFN and the WHO are again collaborating in the production of the successful Neurology Atlas, second edition, as the first edition is now 10 years old. This process involves gathering information from Ministries of Health and all WFN member societies so that the data are verified and are useful tools for all. The involvement of the WFN with the Non Communicable Diseases (NCDs) declaration is vital for the future of neurology. There is now a clear perception that the WHO is moving from the preventative mode, which has fully dominated its activities, to the area of disease management and appreciation of the huge burden of neurological diseases in the world. This, when it evolves further, is a seismic shift in thinking, and the WFN should be ready when it happens. The close collaboration and financing of many projects through the WHO is crucial for neurology, and the WFN should be at the top table in the decision-making process. Many tasks lie ahead for the WFN trustees. For examples, finding and hiring a PCO when the contract with the current PCO Kenes expires with the last contracted congress in WCN 2015 in Santiago; and finding a publisher for JNS when the contract with Elsevier expires at the end of 2014. These are important decisions, and the trustees will have to look at all of the options and come up with the most suitable ones for the WFN. As delegates were informed, the Nominating Committee is soliciting nominations for the post of elected trustee. Prof. Gustavo Roman will finish his second term and is not eligible for re-election. His contributions to the WFN as a trustee and as chair of the Latin America Initiative are immense. I, on behalf of all trustees, committees and member societies, would like to thank him for a wonderful job, which was done with grace, elegance and professionalism. The next Council of Delegates meeting will be held in September in Boston, Massachusetts. This will be during the joint meeting of the American and European MS societies, and we look forward to seeing as many society representatives there as possible. As an addendum to the report from the AmericanAcademy of Neurology in this issue, I wish to add that in 2012 the AAN established a Global Health Section. 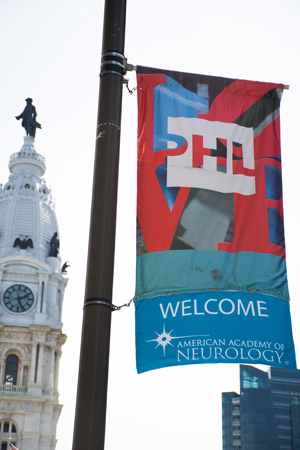 At the section meeting during the 2014 AAN meeting in Philadelphia, Jerome Chin, the outgoing president of the section, announced that the section now has more than 300 members, including many from outside the U.S. The section elected Farrah Mateen from in the Department of Neurology at Massachusetts GeneralHospital as its new president. If you are interested in seeing the activities of the Global Health Section, contact Franziska Schwarz at FBSchwarz@aan.com. In these ways, the AAN is now playing an important role in global neurology together with the World Federation of Neurology.